This week will mark the 45th anniversary of the Munich Olympics Massacre and the dedication of a new memorial in the city. This week also marks 45 years of BBC News failure to describe the members of the PLO faction that perpetrated the attack as terrorists. The BBC’s ‘On This Day’ archive includes an item dated September 6th 1972 and titled “Olympic hostages killed in gun battle“. In that report the BBC described the perpetrators as “guerrillas” (despite the fact that their victims were civilians), “militants”, “kidnappers” and “gunmen”- but not terrorists. Over the next 24 hours, the tense stand-off between gunmen and police was played out in front of television viewers worldwide. “The 1972 summer Olympics are mostly remembered for tragedy, rather than sporting achievements. It was there that 11 Israelis were killed after being taken hostage by members of a Palestinian militant group, Black September, on 5 September. “The killing of 11 members of the Israeli team at the Munich Games of 1972 remains the darkest chapter in Olympic history. The terrorists had asked for the release of 234 people from jails in Israel, but Israel would not negotiate. Eventually, there was supposedly an agreement that the group would be flown out of the country and helicopters were brought in. In reality, the Germans’ plan was to ambush the kidnappers. An additional exception to the rule appears in the synopsis to an edition of the BBC World Service radio programme ‘Sporting Witness’ that was broadcast in April 2016. Notwithstanding those exceptions (and the impression that BBC sports journalists make a better job of using accurate terminology than their counterparts in the news department), the dominant BBC editorial policy over the years has been to refrain from describing the 1972 attack on the Israeli Olympic team as terrorism and its perpetrators as terrorists. After forty-five years it is clearly high time for BBC News to ensure that reports relating to the 1972 Munich Olympics Massacre use accurate and consistent terminology which clarifies to audiences that the incident was an act of terror perpetrated by terrorists. Veteran BBC journalist Peter Taylor recently produced written and audio reports relating to his long career reporting terrorism. The BBC News website’s UK page published an article titled “Peter Taylor: How has terror changed in 50 years?” on March 31st, the majority of which relates to Northern Ireland. “Peter Taylor reflects on his 50 year career reporting terrorism. At the time “terrorism” was barely in our vocabulary. In the hundred or so documentaries he has made on the subject since then, Peter has tried to get behind the headlines to understand and explain a phenomenon which has grown to affect us all. Significantly, Taylor made no attempt to define terrorism during that almost one hour-long programme, telling listeners at one point that it is “open to different definitions”. However, at 05:31 minutes into the programme, Taylor did provide listeners with the sole example of what he termed ‘state terrorism’. However, when Taylor later (at 21:07) described a British response to terror attacks he did not categorise it as ‘state terror’. As we know, the BBC’s ‘rationale’ for avoiding the use of the word terror and its derivatives is that the term “carries value judgements” and so it comes as no surprise to see the perpetrators of the Munich Olympics massacre described – as usual – without that word being used. However, the BBC is clearly nowhere near as reluctant to make a “value judgement” concerning Israel’s response to acts of terrorism – but, notably, refrains from describing its own government’s very similar actions in the same terms. 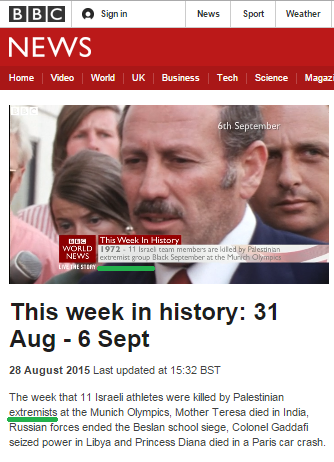 The current edition of the BBC News feature ‘This week in history’ includes the murder of eleven Israeli athletes at the Olympic Games in Munich in 1972. As can be seen below, both in the synopsis to the clip appearing on the BBC News website and in the on-screen caption in the video itself, the BBC has once again avoided the use of the word terror, preferring to describe the perpetrators as “Palestinian extremists” and a “Palestinian extremist group”. 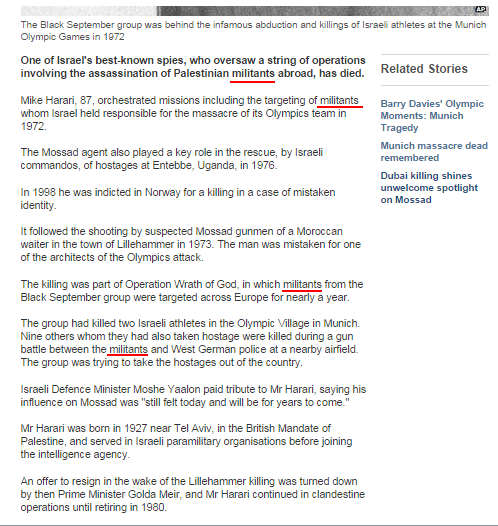 On September 22nd the BBC News website’s Middle East page carried an article titled “Israeli Mossad spy Mike Harari dies, aged 87“. Remarkably, in that report the terrorists responsible for the murders of eleven Israeli athletes at the 1972 Munich Olympic Games are rebranded “militants”, the terrorist organization to which they belonged is termed merely a “group” and no mention is made of the Black September Organisation’s links to Fatah and the PLO. No less bizarre is the article’s failure to inform readers that the rescue operation at Entebbe which it mentions was brought about by a hijacking carried out by another Palestinian terrorist organization – the PFLP – and just as interesting is the fact that the title of this report was changed some thirty-five minutes after its publication, with the original headline having read “Mossad agent behind Palestinian assassinations dies”. The BBC’s ‘rationale’ for avoiding the use of the word terror and its derivatives is that the term “carries value judgements”. As we have on occasion noted here before, the corporation’s abstention from use of the word in some circumstances and geographic locations (see related articles below) is evidence of a double standard which reveals politically motivated “value judgements” in itself. Where can terrorism be named as such by the BBC?